Infinite Dunamis possesses a steampunk-style world and story and is quite different in that regard to most of Kemco's other JRPG offerings. 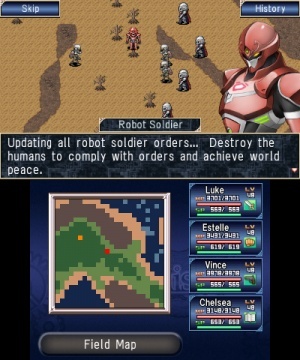 The battle system is fairly straightforward, however there are a few unique elements that make it feel a little more unique. The level of customization of Estelle, one of the main characters is definitely one of the highlights of the game. The controls are easy to learn and very intuitive which is always a good thing, in-terms of difficulty, the game is no cakewalk especially later on, but it's not overly difficult either so don't expect to get stuck too often. Visually the game looks decent enough, sure it's not going to win any awards in this regard, but it still looks nice for a budget title! The sound-track on the other hand is superb and fits the mood of the game quite nicely! 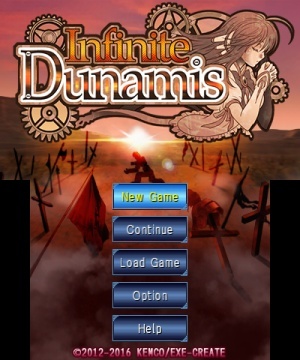 With solid gameplay, a fairly unique steampunk story, excellent controls, and a well-balanced level of difficulty, Infinite Dunamis is a rather enjoyable JRPG that fans of the genre should thoroughly enjoy! The visuals are decent enough, but the sound-track is definitely the high-point of the game. If you're a fan of Japanese roleplaying games, you'll be right at home with Infinite Dunamis! This year has been so wonderful for 3DS Jrpg's. Superb review as always, @Ichigofan!